marie fly fly: Warm gloves for Spring.. 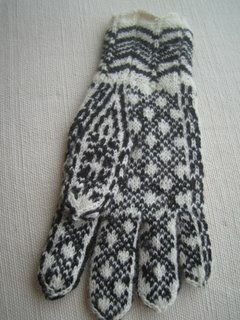 I finished the second Selbu glove last night, and I still have more to say about this subject! I'm not sure if it shows in the photo, but it is obvious to me that the rose is much more distinct in the second glove (which is the right hand glove at left in the picture). I tried out the yarn dominance technique that I mentioned in my 25 March entry, making the black yarn the dominant colour, and I think it made a very notable difference. I'm not sure which glove I like better, but I think it was very interesting to try it out. And what happened when I managed to knit with both threads at once? Well, my speed picked up considerably. I finished the main part in a few hours last weekend (but still spent many evenings fidgeting with the fingers.) The gauge loosened a bit, however, I think the photo shows that the second glove is slightly bigger. It is also more wonky, so clearly I must practise more. But the new technique stays - it was amazing to be able to knit stranded at almost the same speed as stockinette. Beth remarked in a comment that it is probably a fine gauge. Yes, the pattern specifies 34-35 st/10 cm on 2 mm needles. Normally I am a loose knitter, so I was very surprised to find that my gauge was close to 42 on 2 mm needles. I didn't do anything about it because I thought the glove was big enough. (This was the first glove - I haven't measured the second). 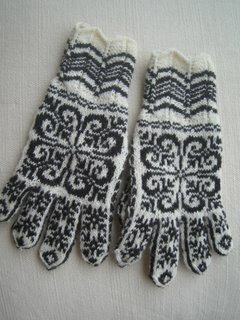 I'll probably knit more Selbu mittens next winter, but I'm done with gloves. I don't think I can find the patience to knit fingers again. Really, these Selbu patterns are very intricate. In addition to the main rose motif on the back of the hand, there is a grid pattern in the palm which is continued on the inside of the fingers, there's a chain on each side of the hand, and in addition they have squeezed in two snowflakes and a diamond on each finger. In a previous post I wrote about the symbolism of the rose motif. But apparently every little design element carries with it some symbolic meaning. According to the Annemor Sundbø book the snowflake is another version of a doubled cross (like the Eight Leaf Star which I wrote about before), which was traditionally a Christ symbol. The diamond is called a crown in Norwegian knitting, but as a small motif, like here, it is probably an eye. In Mediterranean countries I have seen eyes painted on boats, and blue eye amulets, meant to protect against the Evil Eye. Apparently knitted eye motifs carry the same meaning. The grid pattern in the palm is another way to ward off evil, spesifically the witch called mare (she is the one of the nightmare). This is the sort of thing Dan Brown would come up with if he were a knit designer! The last picture shows the palm with the grid and the chain. They are beautiful - I know you found them fiddly, but believe me - it was worth it. Oh, girl, the gloves turned out beautifully! I see what you mean about yarn dominance--I'd never given it much thought but what an interesting difference. 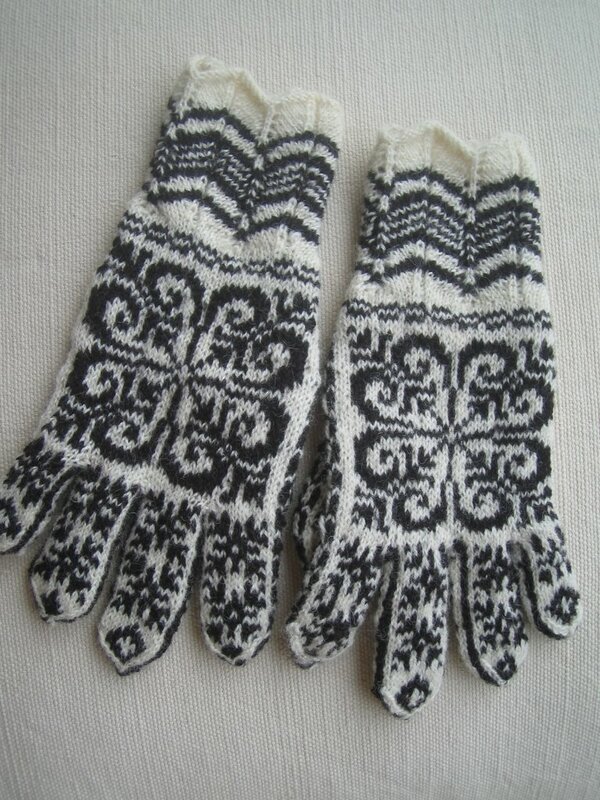 I just bought the book Latvian Mittens and will try one of those before tackling gloves. I dislike doing fingers with a single strand and absolutely dread the thought of doing them with multiple. These are so beautiful, they are to be treasured. I love all the intricacy and detail. I also find the symbolism and history fascinating. How interesting about the yarn dominance. I can definitely see the difference in the photo. I realize, of course, that just having finished the project you're able to make a thorough critique. However, they're absolutely beautiful and something to be proud of. and they have to be some of the prettiest gloves I've seen in a long time, perfect.